The 21st Screen Actors Guild Awards’ red carpet was kicked off by Actor® nominee Reid Scott (“VEEP”) and Champagne Taittinger's Artistic Director Vitalie Taittinger toasting both the awards ceremony and the 15-year Champagne Taittinger-SAG Awards® partnership. Celebrities making their way down the 17,100 square feet of red carpet greeted over 300 fans in the bleachers and nearly 200 media outlets from all over the world. Fans were thrilled as nominees Julia Roberts, Jennifer Aniston and Eddie Redmayne were among several stars that stopped to sign autographs.  SAG Awards nominees had been waiting for this evening since Ansel Elgort (“Divergent,” “The Fault in Our Stars”) and actress/director/producer and SAG Award recipient Eva Longoria had announced their names in December. SAG Awards Committee Chair JoBeth Williams and Vice Chair Daryl Anderson had the pleasure of announcing the Outstanding Action Performances by Film and Television Stunt Ensembles on the live “21st Annual SAG Awards Red Carpet Show” webcast on sagawards.tntdrama.com , sagawards.org and PEOPLE.com . In the Shrine Exposition Center, for the first time in SAG Awards history, 20,000 white roses adorned a stage framed by two broken prosceniums that were decorated with gold serpentine scrolls. Oversized gates on either side of the stage marked the presenters' entrances and a large gold-trimmed screen upstage showcased nominated performances and filmed tributes. Upon gunmetal crinkled organza table coverings, renowned chef Wolfgang Puck placed a beautiful antipasto plate featuring three different dishes, including a vegan option. The delicious cuisine was complimented by Taittinger Champagne, four new Treasury Wines varietals and FIJI Water. Just prior to the telecast, Actor® nominee Julianna Margulies introduced a filmed tribute to the philanthropic activities of the SAG Foundation, PEOPLE magazine and the Entertainment Industry Foundation. For the 19th consecutive year, PEOPLE and EIF hosted the evening's post-awards gala, celebrating the generous, multi-year donation to the SAG Foundation honoring actors' charitable work. The memorable “I am an Actor” stories kicked off the night, which featured several historic moments. SAG Awards bestowed upon Uzo Aduba (“Orange is the New Black”) and Viola Davis (“How to Get Away with Murder”) marked the first time in the same year African-American actors received individual Actors® in both the comedy and drama categories. The 40-member “Orange is the New Black” comedy ensemble became the largest cast honored with Actors®. Actress/writer Carrie Fisher presented SAG-AFTRA’s highest honor, the 51st Life Achievement Award, to her mother, the legendary Debbie Reynolds. SAG-AFTRA President Ken Howard presented a film compilation highlighting performances that have reflected vital social issues while Liev Schrieber introduced an "In Memoriam" montage honoring some of the many performers who passed away in 2014. Kevin Costner announced the evening’s last prize: Outstanding Performance of a Cast in a Theatrical Motion Picture. Upon completion of the ceremonies, attendees made their way to the official PEOPLE/EIF Gala, which recreated the prohibition-inspired, decadent and secretive spirit of the 1920’s. As guests relaxed and chatted on the green sofas and plush booths, they noticed the framed images of previous SAG Award recipients adorning the walls and were treated to wines by Matua, Taittinger Champagne and exclusive SAG Awards cocktails by Patrón, aptly titled – “Cheers to the Actor®!” and “The 21.” DJ Michelle Pesce provided the musical entertainment.